Getting back in the swing of school & life in general is so difficult after a long break. What I've found that has really helped me spring back is working out. But I want to tone up as much as possible before the wedding comes along & it's quickly approaching! I was in such a good place a few years ago, but then I started dating C & basically, I got comfortable and I got lazy and I didn't maintain the healthy lifestyle that I had been living. I don't have a radical diet plan that I'm following now, I eat basically what I want but I just try to control my portion sizes & I don't really eat anything that is just awful for you. But y'all, my biggest motivator isn't even the wedding-it's the clothes. 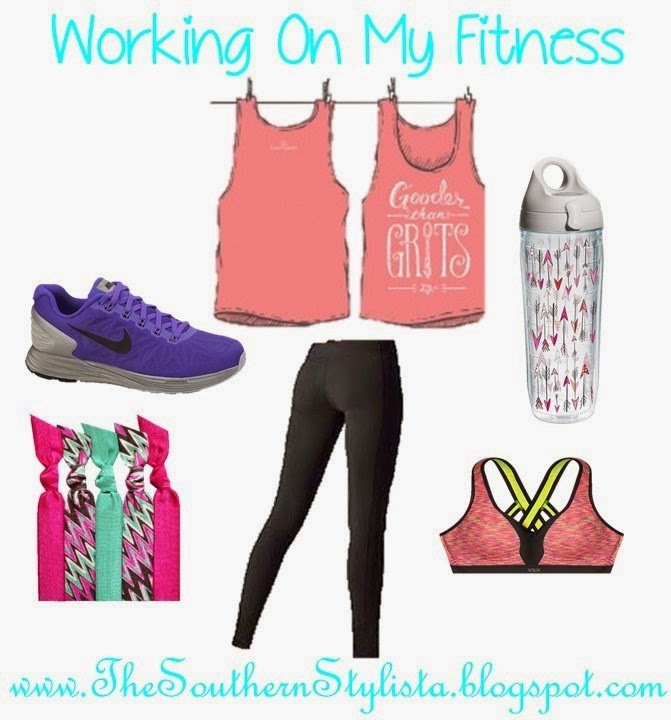 Today, I'm sharing with y'all my favorite workout outfit & why I love it so...enjoy! The tank top is from Lauren James, but I saw this one on sale from Country Club Prep so I knew I had to include it! I love that the one I have is over-sized & so comfortable to work out in. The shoes are Nike Lunarglide shoes from Academy. I bought my pair similar to these (in black) my junior year of high school (which is way too long for tennis shoes, I know) but they are still in great shape & still so comfy! The leggings are the Knockout Leggings by Victoria's Secret. I don't have this exact pair, but my all time favorite leggings for every day use & wearing to the gym are from VS. They're great quality & have lasted so long. The sports bra is also from VS. I haven't personally tried this sports bra before, but the reviews on it are great. I would love to try one out, I think this color would look great underneath the tank I featured. Tervis is one of my all-time favorite companies & this water bottle is too adorable to not include! These Emi-Jay hair ties are also life-savers for gym days. These are great because they don't leave the dreaded dent in your hair! I am obsessed with all the fun color options that they have too, something for everyone. I hope y'all enjoyed this & I hope it gave you a little inspiration along the way! I love working out! These pieces are absolutely beautiful! I LOVE VS workout gear! Oh my goodness, that gooder than grits tank is adorable!! I definitely need to add that to my closet. I'm obsessed with all of Lauren James tanks, they are SO cute! loving that gooder than grits tank -- LJ is one of my favorites! I personally really like wearing Nike and VS, Nike has great running gear and VS is awesome for yoga pants. I think getting new gear is always a nice motivator. Thank you for sharing. This would be a perfect post for our Lavish Lemon link up! Have a great rest of the week! My pleasure, thank you for joining the link party. Have a lovely rest of the weekend! I don't think I would be able to convince myself to workout if it wasn't for the clothes;) Love your choices! I'll have to stop by & check out your giveaway, thanks for stopping by! I'm trying to get back on the wagon too! It's so hard when it's so cold outside & all you want to do is snuggle up though! Love, love, love the tank top. Got to love country girl clothing .